« Blogfinger opinion poll: Do you support permit parking in Ocean Grove? Please vote only once. Wesley Lake Gallery with some comments by Ted Bell, OG environmentalist and historian. Wesley Lake postcard. Undated. Click these postcards for more detail. Notice how rural the Asbury side appears. There are many trees there which are mostly all gone now. There are boats at both shores, but especially on the Ocean Grove side. Lake Avenue appears to be a boardwalk , and clearly it was not intended to be a street. There is no bulkhead back then. 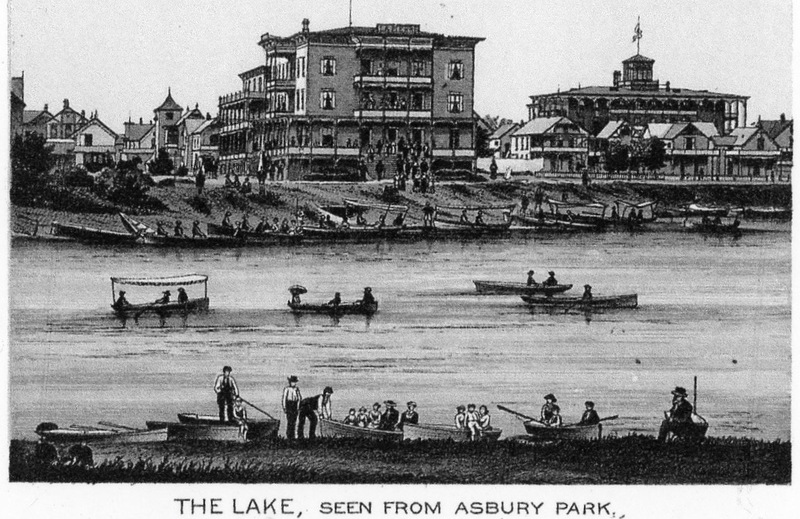 In the early 1800’s there were seven coastal bodies of water from Avon to Long Branch draining into the Atlantic Ocean. By size Deal Lake was the largest with Long Pond (later, Wesley Lake) as the smallest. 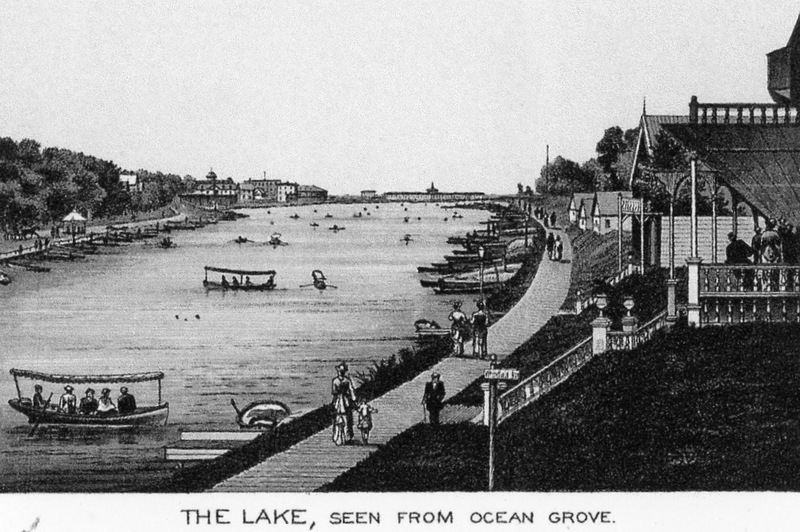 Years passed, and Wesley Lake became more of a recreational area with over 300 boats available for pleasure and transfer of people from and to the camp meeting grounds of Ocean Grove. Eventually bridges were built connecting Ocean Grove to Asbury Park. Tolls were collected and shared by the two communities, until the cost of the bridge was paid from the tolls collected. As a coastal lake Wesley Lake had a natural opening to the ocean. Tides occurred every 12 hours as there was no natural barrier to the flow of sea water into and out of the Lake. Early pictures show a debris line along with some vegetation along the lake shore with a band of sand/silt further up on the sides. This is an indication of tidal action. Several dams were constructed at the ocean end, turning the Lake into a fresh water lake. The tidal line disappeared. The Lake, over the years, became a silt basin with occasional overflows from heavy rain storms. The question of State Riparian Rights is not addressed in the Annual Reports of the Camp Meeting. The area around Fairly Island was also filled. At some time the Lake was bulk-headed. The two level terraces from Pilgrim Pathway to the ocean were filled , and a cement wall was constructed (? PA project.) The rest of the lake was bulk-headed. The bulkhead eliminated most of the pleasure boats due to docking problems of the passengers embarking/disembarking from the boats. Sometime around 1978-1982 I remember finding living shells in the lake. I’m not sure of the name, but it was very thin-shelled and some actually contained small shells inside. I also found them in the ocean near the outflow pipe. I can’t imagine they can live in the current lake, and that’s a big change in less than 40 years of local development runoff. He has been observing them in the Lake for some time. This class of creature has about 4,000 species, but the fresh water variety is unusual.